Todays the day Dominic was discharged. He had a 90 min physio session first but then we were outta there!! Cannot believe the op and hospital stay are all done and over with. We were a little nervous about bringing him home as he is still very nervous but that is getting better and better. I could actually have him on my lap and give him a proper cuddle for the first time in 5 days! It was very sweet without any prompting we turned the corner in the shuttle and as the hotel driveway came into site he let out an hooray and had the biggest smile on his face. He spent the rest of the day in the apartment with Daddy and mum and I went off to fill the place with toys to help with encouraging him to practice his kneeling and sitting. Going to get him out and about tomorrow before his physio in the afternoon as I have a feeling if he had the opportunity he would spend the whole day in comfy hotel bed!! Posting a few photos Mum took of the roof Garden at the hospital for all the patients to use. It is really stunning and was a lovely place to escape and sit and read for half hour occasionally. 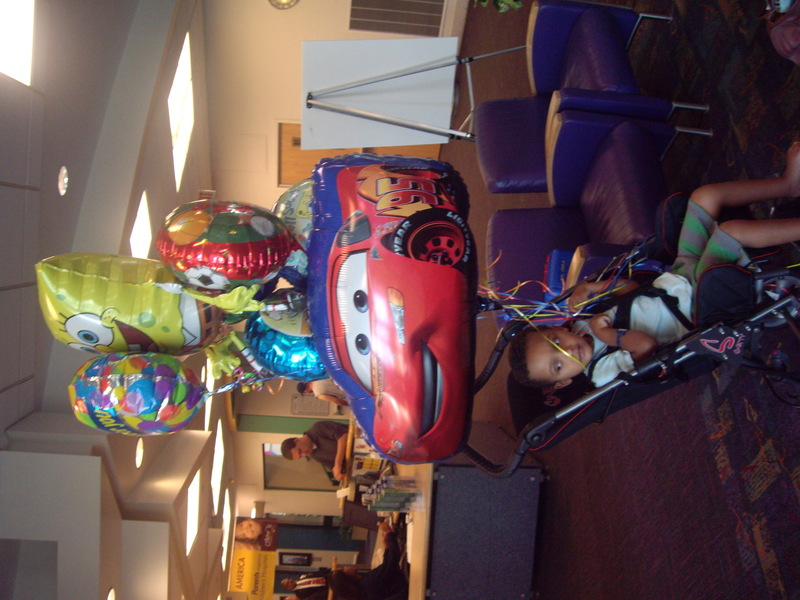 Also of Dom leaving the hospital with all the balloons. Will blog again in a couple of days Thanks everyone for following our story over here it is great to think we have all these people out there supporting us. 1 Response to Going Home!!! We are so pleased to hear that you are doing well and looking forward to seeing you in September.